Going Bananas with Homemade Banana Ice Cream and More! I was going Bananas in more ways than one this weekend! On top of a Basketball Tournament, someone had graciously given us a half of a box of bananas that were very ripe! I needed to do something with them quick! So in between games, this is what I did with them.. I made Banana Ice Cream! If you are looking for something sweet and deeelish, but are Diabetic or Gluten Free..this is for you! Of course it’s for the rest of the world too because it is sooo good! Banana Ice Cream is very easy to make because it has ONE ingredient..BANANAS! Simply freeze some Bananas, after they are frozen..cut them up and put them into a blender and blend until a creamy consistency..like soft serve Ice Cream. If you want it a little more like Ice Cream out of a carton..just put back into the freezer after blending for about an hour! You can add just about anything you want while blending to give a different flavor, such as peanut butter, berries, chocolate, strawberry..umm the skies the limit. I topped with chocolate syrup.. I peeled and flash froze a ton of bananas for Smoothies..
Then of course I made some Banana Bread! 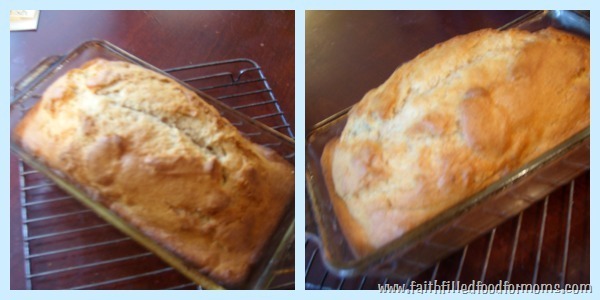 This is my Grandmother’s Banana Bread Recipe that I always use..it has shortening in it but you can experiment and substitute Applesauce if you are opposed to using it. Cream shortening and sugar; add eggs. 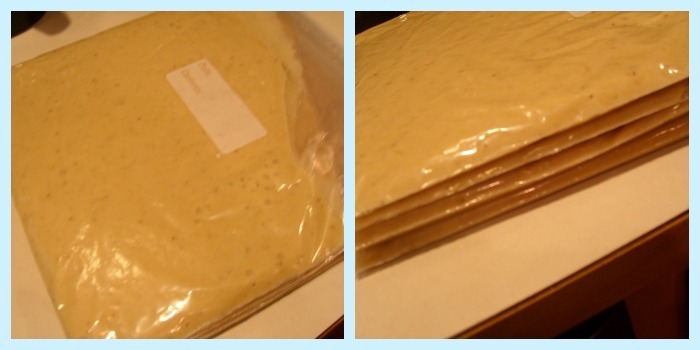 Mix flour with the other dry ingredients. Add dry ingredients alternately with the bananas and mix thoroughly. Add Nuts.. and Bake at 350 degrees for at least an hour. Check for doneness by inserting a toothpick or thin knife into the middle..if it comes out clean then bread is done. Last but not least, I Pureed Bananas in the blender so that I could quickly make more – I put 3 cups in each bag! So tell me, what do you make with your ripe Bananas? « Faith Filled Humor-Reminding Everyone to Take Time To Laugh! That’s awesome Audrey. My grandson and kids loved it and it was sooo easy..I mean who can beat ONE ingredient! 🙂 Blessings! 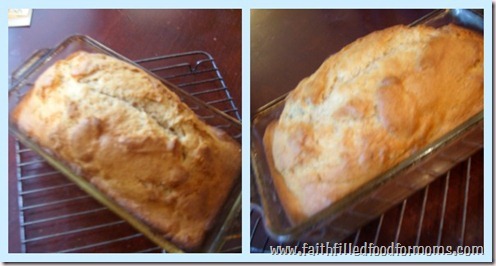 I’m a big banana loaf fan as are my kids! But that ice cream looks amazing. Yay! It’s fun to try new things isn’t it Susan. Thanks so much for stopping by! Blessings to you! Hi Deb…oh now that sounds sooo deeelish! Gotta start that blog.. 😉 thanks for stopping by and blessings! 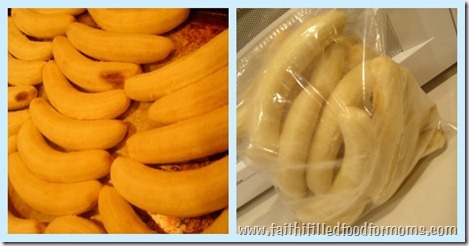 I try to freeze the bananas if they are getting too ripe, but never take them out of the peel first. Why, oh why not, I don’t know… Banana bread is a favorite around here — usually I do it as muffins because the kids like it that way. But the ice cream? Now THAT is a keeper! I do both ways OneMommy..I decided I like to do freeze them without the peel though..just a little easier when time to use 🙂 We love Banana Muffins too! I’m glad you like the ice cream too and soooo easy! Blessings! This is a great post Shari! I’ve always just made banana muffins or banana bread. I never thought of banana ice cream. I know Banana Ice Cream! I had never heard of it before either and it is REALLY easy and REALLY tasty! Blessings! Thanks for sharing this with me on stumble girl! Thanks for loving it Susie!! Blessings! I love bananas Shari, and I am positive I would love its bread too. Thanks for sharing on SU with me. Going to try the banana ice cream! My kids got me a Yo-nana ice cream maker for bananas last year and we loved it but it didn’t last very long. Hi Sue! So nice of you to stop by! This is sooo easy..I really had NO idea just how easy 🙂 Enjoy and no need for a machine LOL Blessings to you!! I make banana bread! I can’t wait to try the yogurt bites! This will be a great per-work treat! I will sprinkle them with nuts-sigh probably almonds. I love pecans but almonds are better for you. Never really tried anything with bananas except eat them. Would love to try a banana Ice Cream, your recipes look easy, thanks for sharing and do have a super blessed Shari.